In an article for the ANU’s Development Policy Centre eighteen months ago (see here), I congratulated PNG’s central bank (BPNG) for its very constructive stance in stopping its effective printing of money to fund the government’s budget deficit. I noted how this reflected positively on the independence of BPNG, an independence built into its charter by Sir Mekere Morauta (PNG’s former Prime Minister) and Sir Wilson Kamit (PNG’s central bank governor from 1999 to 2009) in response to PNG’s last major economic crisis in the late 1990s. 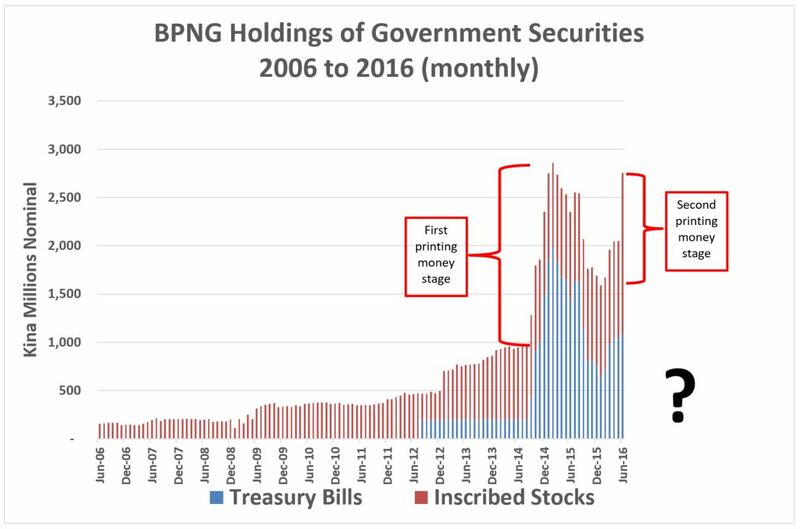 As shown in the graph below, the central bank started buying surplus government securities (those that no one in the private market was willing to buy) in September 2014. This continued through until March 2015 when the bank announced that it had reversed its earlier policy. This was the end of first phase of effectively printing money. Over the remainder of 2015, despite the increasing cash shortages facing the government, the central bank persevered with this policy which helped ensure the government finally started to address its budget problems and reduced the risk of accelerating inflation. In an extremely worrying trend, the central bank started purchasing large amounts of government debt from February 2016. Over the next five months BPNG acquired K1,167.7 million in extra government securities. This is over half (55.3%) of the government’s expected budget deficit for the full 12 months of 2016. Indeed, for the single month of June 2016, the increase was slightly over K704.8 million – the largest monthly increase in BPNG’s history (the next highest was K508.7 million in October 2014 during the first stage of effectively printing money). The data stops in June 2016. Has the situation improved since then, or become much worse? I did ask BPNG for any updates on the figures last week but there was no response (which is the usual government reaction to any of my requests for checking or clarification). So why is this a problem? Primarily because economic history indicates that a central bank buying any surplus government bonds is a very slippery path towards over-heating the economy and hyper-inflation with all of its disastrous impacts for growth and well-being. This is the Zimbabwe example, the Germany Weimar Republic pre-World War 2 example and many, many others. So how is this different from “quantitative easing” in developed countries such as Japan and the US. There are several important differences. First, there are very few inflationary risks in these countries – to the contrary, there had been fears in Japan and the US of “deflation” prior to introducing the policies. PNG’s inflation rate has already started creeping upwards even though its managed depreciation has now stopped. Second, the “quantitative easing” policies in the US and were directed at restoring private sector economic growth by increasing the level of credit in the banking system – not simply financing a government budget deficit. Government spending may also be important for growth, but that depends on the quality of the government spending. For PNG, recent budgets have seen massive cutbacks in key sectors such as infrastructure (where the level of spending now is less than 2011 ) and key longer-term social investment spending (in effective health and education programs). The biggest areas of expenditure growth have been in interest costs, government administration and political constituency funds – none of which could be seen as pro-growth government spending. Third, developed countries have used “quantitative easing” as a very transparent and public measure designed to build economic confidence. In the case of PNG, this appears to be a policy done by stealth. 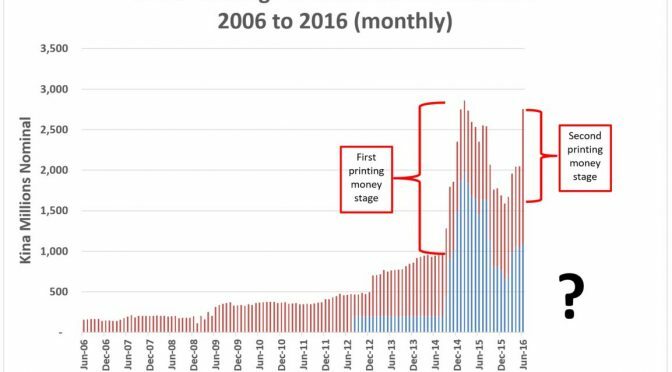 Unlike the start and ending of the first stage of effectively printing money shown in the graph above and described in the top two links, I can find no comment on the public record about this change of approach since February 2016. Fourth, there is no public “exit” strategy. The return to a government surplus keeps getting pushed back. The lack of transparency inevitably raises fears. 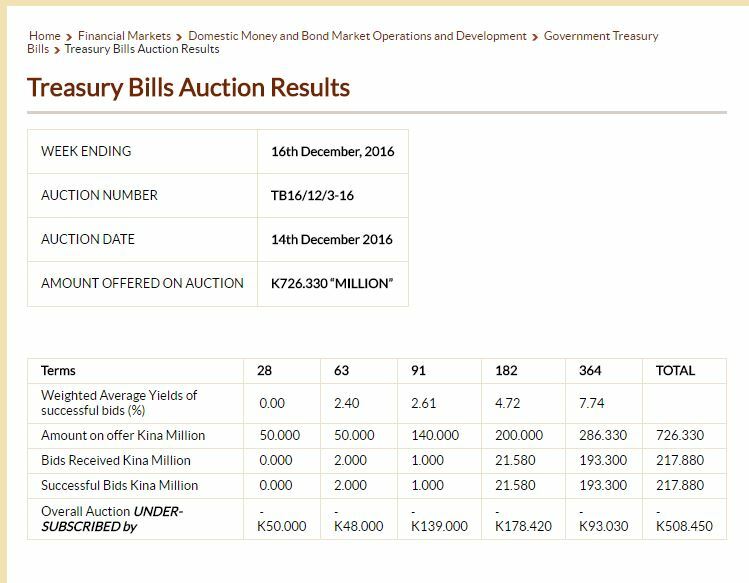 Following is a snapshot of the 14 December weekly Treasury Bill results. The government asked financial markets last week for K726.33 million. The private sector (mainly PNG’s banks, superannuation funds and finance companies) only decided to buy K217.88 million of these Treasury Bills. The shortfall in that week alone is an extraordinary K508.45 million. Will the Bank of PNG have to step in and pick up the tab? Finally, PNG does not have the offsetting policies that can help minimise the damage to macro-economic stability from this quantitative easing. Specifically, PNG no longer has a market-related flexible exchange rate, and there is no clear wages policy (although recent indications of some public sector wage restraint is welcome). The central bank of PNG appears to have moved PNG’s economy back onto a slippery slope of effectively printing money. Providing a blank cheque to the government also squeezes out the private sector in such important areas as getting access to foreign exchange. Alternative financing options for the government’s deficit over recent years have not gone well – the so-called Government Sovereign Bond and the funding from the IFC – and the full costs of the Credit Suisse loan are unknown. Even minor attempts to increase tax in the 2017 Budget appear at risk in the January Supplementary Budget due to political pressures. Expenditure cuts have been too severe and in the wrong areas (see here). If there is a change of government in mid-2017, much work will be required to restore PNG’s economic credibility.